We never heard of the place and had no intention of going there. 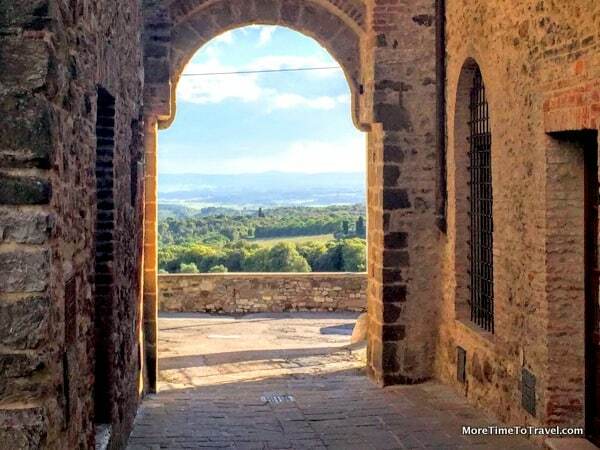 In fact, discovering the most charming small town in Italy was a result of a serendipitous wrong-turn off a small road in the Chianti region of Tuscany. We and two other couples were staying at a nearby VRBO rental villa, Cappelli di Pancole, only seven minutes away, when we got lost while headed to the city of Siena (about 10 miles from the villa). From the outside looking in, San Gusme looks somewhat like a planned, age-restricted community in the states. Located on a hillside about 1500 feet above sea level, some of its medieval fortification walls still remain intact. Now they incorporate stone buildings, nearly uniform in color, which almost appear to be embedded within them. Any remotely curious person traveler would have parked outside the walls, as we did, to see what was inside. Tourists have few reasons to visit San Gusme—intentionally. It’s not mentioned in most guidebooks. A local told us the population is currently hovering around 89 people; Wikipedia estimates it at 250, more than twice that number. But whatever measure you use, the town is teeny tiny small; young residents tend to leave because understandably, employment prospects are slim. Although once strategically important in defending Siena, San Gusme has no monuments or museums to speak of except for the peculiar terracotta statue just outside the wall. Intrigued to learn more? Be sure to read The Strange Legend of Luca Cava in San Gusme on GettingOnTravel. San Gusme hosts a Luca Cava Festival each year on two weekends in September, offering food, crafts and wine for visitors. It’s also the occasion for naming an annual recipient of a journalism award named after Gigli. The narrow streets of San Gusme are punctuated with colorful potted plants in springtime; they seem to wind around in a concentric circle that makes it impossible for the visitor to get lost (once inside!). The town has two towering churches, the Church of the Most Holy Saints Cosma and Damiano, and Church of the Santissima Annunziata. We returned multiple times during our stay and the only other public spaces we found were a bank, post office, diminutive alimentary (grocery store), sarta (tailor shop), two informal restaurants with bars, and two social clubs tucked between houses. What appeared to be a never-open store was actually an apartment window decorated with antiques. While peeking into another shop, an octogenarian tailor and his wife gestured, inviting us in to talk. (In a town of this size, strangers stick out immediately.) When he showed off his tailoring, we struggled to communicate in Italian, telling him we weren’t going to be there long enough to order custom clothes. We left after a few warm hugs. On another visit, we purchased the last chunk of freshly baked bread in the grocery shop and were dazzled by the redheaded shopkeeper’s smile. She told us she was a transplant from the south. We fell in love with the warmth of the shopkeepers, and the intimacy and stillness of the town’s streets, especially at night, when the church towers were illuminated. Looking outward, the views from San Gusme are a treat for the eyes as well. Perched on the hill, it overlooks the surrounding countryside dotted with cypresses, grapevines and olive trees. If you focus, you can almost see Siena. San Gusme is administratively classified as a frazioni, a clump of houses within one of Italy’s comuni (townships). It sits within the comune of Castelnuovo Berardenga, in the province of Siena. Nearby and worth visiting is one of the Jackson Family wineries, Arcanumis. The magnificent Castello di Brolio with its gardens is located in Gaiole, about 5 miles away. We didn’t notice any hotels or inns within the walls (although they may have been hidden) but VRBO offers rental properties in the area like the one we stayed at. A waiter in San Gusme introduced us to a knowledgeable, English-speaking local driver (who happens to be a Curb Your Enthusiasm fan, Giancarlo Zito. Zito operates My Tuscany Vacation, offering local tours and transfers. What an enchantingly beautiful place! Absolutely amazing! Especially because it was so unexpected! Your affection encourages me and makes me happy. Thank you so much! Love finding such villages in Europe – and each we label the most charming until we find the next! Beautiful post and great tip for the next time we are in the area. What a treat to stumble upon a hidden gem like San Gusme! Love your description, Irene, really makes me want to go there. It does look charming. I love finding places like this by accident. Makes the “find” twice as nice, doesn’t it? Charming! I love that you snapped a photo of the redheaded shopkeeper. A lovely photo to go along with your words. While on our way to Siena several years ago, Conrad and I happened upon Barberino, a very similar Medieval village — just a stone’s throw north of San Gusme. We were quite smitten! Over several years of travel there, Italy delivers big time in the charm department. History, food, and architecture play a large part, too, of course. Each time we love it more. Yes, Italy always seems to provide new discoveries! I’m going to make a note of Barberino! Thanks for the tip! Yes, Italy has so many layers and if you are a food enthusiast, that’s reason alone to visit! I had to laugh at the statue of Luca Cava – (the patron saint so-to-speak of San Gusme!) What an intro to the city but it would make you curious to find out more about the people who live there. I love your photo of the beautiful red-headed shopkeeper but all of your photos just ooze charm! So often when traveling those wrong turns are the places you remember most and San Gusme is a little treasure. I love Italy and would have no problem getting lost (I did many times) so coming upon this town would be a bonus. Hard to believe that there are only 89 people who live there considering they have the Luca Cava Festival! As for Luca Cava. What a story! San Gusme sound absolutely delightful. It is so great to stumble upon gems like this. Yes, one of the best parts of travel is finding a great hotel, restaurant or town (or a local person, too) –that far exceeds your expectations! Vi ringrazio infinitamente a nome mio e di tutto San Gusmè, un onore per noi accogliervi in questo piccolo borgo del Chianti Senese! Grazie per le belle fotografie e per le belle parole amichevoli e pertanto vi aspettiamo a braccia aperte sperando di potervi conoscere tutti personalmente!!! When I woke up this morning, I was delighted to find out that I received the note above from the woman in the store, whose name I did not know, Sabrina! I don’t know how she found this post! I thank you infinitely in my name and all of San Gusme, an honor for us to welcome you to this small hamlet of Chianti Senese! Thanks for the beautiful photos and nice friendly words and therefore we look forward to your open arms hoping to be able to meet you all personally !!! So glad I stopped by after you received the note from the charming Sabrina. How much more enchanting can a small town be? And how wild that she came across your post!! If you are going to get lost, I can say I’ve never read of a better spot then San Gusme! Now that I have a new “friend” in San Gusme, I certainly have a reason to return! San Gusme looks so adorable! Those old fairytale walls are just my style. I loved Sienna, but now I wish I had gotten lost and found San Gusme, too! Hope you return and get another opportunity to visit San Gusme, too! Such a charming little village. It’s nice you were able to return over and over again to get to know the tiny village so well!! troverete il sito internet se avrete voglia di ritornare e prenotare proprio a San Gusmè. Vi sono diverse opportunità..questa è meravigliosa!!!! In English: You can stay right in the walls, take a look at this wonder. You will find the website if you would like to return and book right in San Gusmè. There are several opportunities … this is wonderful !!!! Grazie a tutte voi, sarebbe una gioia avervi qui…magari tutte insieme!!! In English: Thanks to all of you, it would be a joy to have you here … maybe all together! San Gusme sounds like an absolutely charming secret little gem! And how nice to receive these notes from Sabrina in the town :-). We will be staying nearby soon and have made a dinner reservation at La Porta del Chianti in San Gusme. Did you notice that restaurant or have a meal there? Our hotel has recommended a few restaurants, and this is one of them. tks for you review of the cute little town. Ciao! I’m jealous! :-) I know you will love this little town! What a wonderful choice! I’m jealous! Please send my love to Sabrina, too! non so descriverti la sorpresa provata alla lettura del tuo articolo sui luoghi del mio cuore: San Gusmè e Galatina, così diversi tra loro ma comunque speciali per l’arte e la storia. “L’arma” della scrittura espressione di sentimento che per incanto apre gli occhi come fossero volti dinanzi a una finestra e si illuminano di volta in volta..di viaggio in viaggio..di parola in parola! I can not describe the surprise you have when reading your article on the places of my heart: San Gusmè and Galatina, so different from each other but still special for art and history. “The weapon” of writing an expression of sentiment that casts open your eyes as if they were facing a window and light up from time to time … of travels on the go..of a word in word! Thanks for the private friendship! It is wonderful people like you that make a town like San Gusme so special. Our meeting was so brief but you have a special place in my heart! I hope we see each other again soon. Hi Irene, my wife and I must be part of a small group of people who have also enjoyed the charm of San Gusme. In fact we have rented a vacation apartment which overlook the square on three separate occasions. By chance we were once there during the Festa del Luca, what an amazing time! The last time we were there, the alimentaria that you spoke of was closed (looked like for good), but I’m glad to hear that it’s back in business and with a new owner by the looks of it. San Gusme is everything you describe, and we thank you for your great article. Thanks so much for sharing your love of San Gusme. How lucky you are to have found this little gem…Sometimes the owner of the food shop, Sabrina, posts photos of the town and the dishes she prepares on Facebook. You might enjoy taking a look here. Sono gli amici e la natura amica che rende speciale un luogo..io posso solo dire grazie a quanti sostengono questo piccolo negozio di sapori antichi..a chi ama questo territorio tessuto da campi di vigneti che la sola vista appaga il cuore dell’uomo..c’è tanta armonia e chi la coglie, come voi, ci consegna benevolenza e non c’è cosa più bella! Grazie! They are friends and nature that makes a special place special .. I can only say thank you to those who support this little shop of ancient flavors .. who loves this territory woven by fields of vineyards that the only view satisfies the heart of man … there is so much harmony and whoever takes it, like you, gives us benevolence and there is nothing more beautiful! Thank you!